CLARIFY Spring 2018 interns at work. 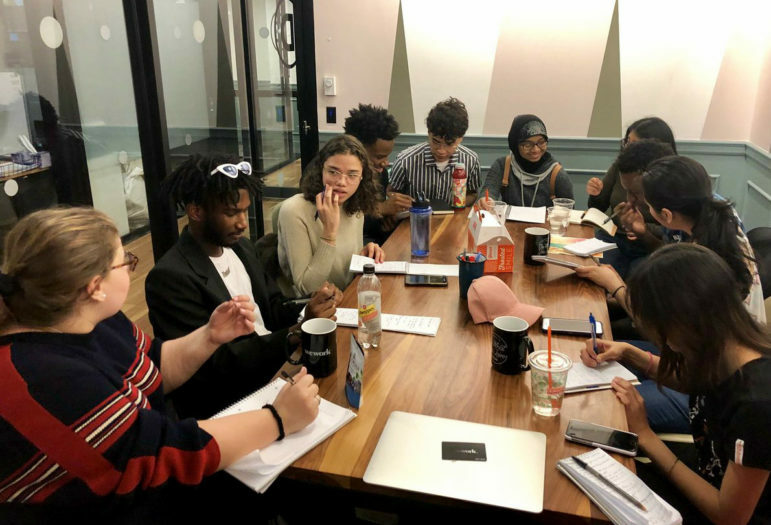 City Limits’ CLARIFY (City Limits Accountability Reporting Initiative for Youth) summer investigative reporting internship will take place for four weeks during July/August. We will begin accepting applications for the program in May; please check back then for more details. The summer program is a four-week paid investigative reporting internship for high school or undergraduate college students. It will teach the essentials of investigative journalism, with an emphasis on reporting with documents and public databases. Interns will work closely with City Limits staff on special projects, with the goal of getting their work published on the site. Interns will also have the chance to hear from guest speakers — professional journalists working in the industry — and take field trips to news outlets around the city. Applicants must live in New York City, and are required to have either already completed an introductory internship with City Limits, or to have some other previous journalism experience. This can include other internships, journalism courses or working for their school newspaper. To inquire about applying for our summer internship, please contact Jeanmarie Evelly at (646) 693-4459 ext. 466, or email Jeanmarie@citylimits.org. (Note: high school students who are new to journalism are encouraged to apply for our introductory internship instead, which takes place during both the fall and spring semesters of the school year and is open to applicants of all learning levels. If you’d like to be notified when we start accepting applications for the fall of 2019, please email Jeanmarie@citylimits.org).